Thanks to Maja for the heads up on the following. While driving up to Mokuleia today we stumbled onto the Lost set. 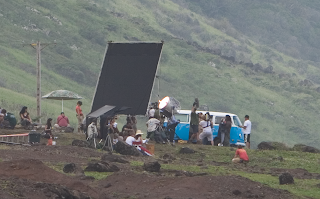 They were filming a scene with Kate (Evangeline Lilly) and Hurley (Jorge Garcia) and his VW camper. They were pretty friendly though and let us pass through the set so we could walk all the way over to the NE-most point. Thanks to Lyly for the heads up. I live on the North Shore, where they shoot Lost. On a hike today near the ocean I saw a scene with Hurley standing around in dark clothes while a blue and white VW bus came buzzing up and stopped by him. An hour later when I was on my way back, I saw that Sawyer (i’m pretty sure) had joined the scene. There were two or three extra blue and white VWs on standby out of scene and the one I saw up close had the Dharma logo on its front. Thanks to The ODI for the heads up. As for J.J. Abrams’s other conspiracy-laced hit, Reddick – who plays Matthew Abbadon, a creepy figure who’s supposedly a lawyer – just finished filming an episode of Lost in Hawaii. Any hints? “I was with Terry O’Quinn throughout the entire episode,” says Reddick, referring to the actor who plays enigmatic island leader John Locke. Lyly for the following. Time to play spot the actor. Young Charlotte And More Reports About Othersville!! As most of you know we have had several filming reports and set photos confirming that we will see the Oceanic 6 back on the island and with many of them in Dharma Jumpsuits. On-Island Losties Sawyer and Jin have also been spotted. Well more fans have sent in reports to our good friend Ryan out in Hawaii providing us with a few new details. 1) New Dharma Logo was spotted on the Othersvlle set, the logo with a wrench in the center! 2) Othersville is freshly painted and looks all nice and new. 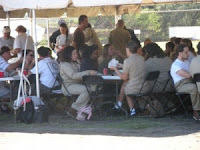 3) A Dharma “Processing Center” is a part of the set, which includes several props including pictures of new recruits. The latest date spotted was 1976! 4) A yellow lab possibly Vincent was spotted. 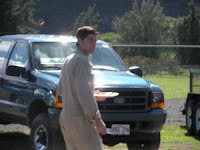 5) Regarding the VW filming on the cliff (photos posted yesterday) Hurley was spotted in the driver seat while Sawyer had a Dharma Jumpsuit on, but Jack was in the shirt in tie still. Kate and LOST Producers Damon and Carlton were on set. 6) At another set at Kawela Bay,some large props were spotted including a structure that seems like a 20 ft tall Teepee with out the covering. 7) Plus, as part of their most recent podcast at The Transmission, we get a confirmation that we will see Young Charlotte and learn about her birthplace afterall perhaps via a Charlotte Flashback or because the island has traveled back in time. You can read the full reports over at Hawaii Blog and you can listen to the podcast at The Transmission. Once again thanks to all the fans for the reports and Ryan for the heads up! Update: 14:30 Thanks to Locke333 for spotting that I’d missed the Extended Promo. Bandar Ceme Online I’ve now added it to the player. I thought it would be useful to make little post that contains all the known promos/trailers and Sneak Peeks. Also, thanks to PkmnTrainerJ for the following note. Some trailers have been shortened to include promo for ABC’s online player such as “An Action-Filled Return”, which no longer features Desmond rushing off, or Richard telling Locke to bring his people back to The Island. I’m sure there’s some other bits, but that one stands out most, as Richard was my favourite part of that one. Maybe the parts removed were considered to be too spoilery? Also this week, we’ve got a merk new video about the LOST BOOK CLUB for you, including a special reading from a book that appears this upcoming season. GAASSPPPP! What’s this? 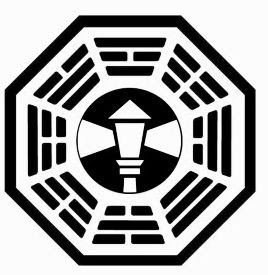 Why, it looks like a first-look at an as-yet-unseen Dharma station logo. Hmmmmmmm… I wonder what the name of the station is? Here is a look at the new Dharma Station Log, guesses below for it’s title and what do you think the Episode 5.07 title 316 refers to? Thanks to GreekCharmed and The ODI for the heads up. MATT: You mean in addition to this boss new video from Team Darlton? OK, but you’re going to call me a big, fat tease. A source tells me that while Season 5, premiering Jan. 21, gets off to a generally strong start, it’s Episode 6 — “The Life and Death of Jeremy Bentham” — that could really blow the roof off the joint. Gotta love Locke. Er, I mean Jeremy.